Twelve issues in, and we’re finally getting what we’d hoped and expected to get from Justice League of America since its announcement! I won’t lie, the issues leading up to this arc have been… challenging. This issue, however, makes up for all of that and is a great jumping-on point! So… Jump on, because Justice League of America just positioned itself to win the mantle of DC’s premier team book! Try to do me a favor (and Steve Orlando a favor as well), put the past behind you! I’ll be the first to acknowledge and speak to the problems that have plagued JLA since it’s conception, but it appears that those problems are mostly in the past now. With “Crisis in the Microverse” we’re getting a story that has purpose, and enough issues to allow the plot and characters room to breathe! Following months of rushed, underdeveloped stories, I can’t tell you how happy this makes me! Now, you might be thinking, “This is just one issue. How are you so confident that the following issues will be as good?” My answer to that is, I don’t. At least not with certainty. I am basing this off of what my personal dissatisfactions have been with Justice League of America, compared to the trend of recent issues and the overall execution of this story’s debut. The main setback for me in JLA has been purpose. I didn’t understand why Batman assembled this team. 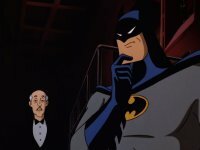 Although that hasn’t been blatantly revealed, “Curse of the Kingbutcher” managed to put pieces together that ties multiple plot points to one another, and hints at why Batman may have pulled this team together. This chapter also plays into this idea as Batman tells Lobo that a fight is coming, and he needs him for that fight. Honestly, this is good enough for me. Batman has a plan for a specific, upcoming threat, and I am comfortable with that being the reason for the team. The next hurdle is story structure. Orlando has been blowing through stories at break-neck speed. The first arc was a mere five issues (but should have been eight to twelve), followed by a two-issue story, a single-issue story, then two more two-issue stories. I don’t want to imply that you can’t write good or successfully short stories (Many outstanding short stories have occurred over the years), but they need to be approached carefully. Try to tell too much of a story, and you end up with a rushed narrative. Try to focus on too many characters, and every character comes across as under-developed, or their relationships feel forced. Try to introduce new characters on top of all of this, and you’re basically dead on arrival… These are all specifics that I’ve called out in other issues, but none of those problems can be found here. Before jumping into the specifics of this issue, we need to revisit DC Universe Rebirth. If you’ll remember, Ray Palmer and Ryan Choi had a substantial tease in the story, where Ray got lost and trapped in the Microverse. This same story was then revisited in Justice League of America Rebirth: The Atom #1, which showed us Ryan’s perspective of what happened during that time. Considering Ryan would be joinging the JLA, and that he’s been obsessed with finding his mentor, it was clear that a search for Ray would be a prominent arc for Batman’s new Justice League. We (the readers) just needed to be patient. Tell me that isn’t a way to start a story! I laughed incredibly hard when I read this, and had to re-read the exchange again because I was so amused. The book then cuts to Canary, Vixen, and Frost, who are all on independent missions. I love this approach, and wish Orlando would use it a little more often because it allows each of the characters ample opportunities to shine. Back at Happy Harbor, Ray and Xenos are holding down the fort, while Ryan continues to work on ways to find Ray Palmer. Dovetailing from “Curse of the Kingbutcher,” Xenos pushes Ray to deal with the events he witnessed and experienced with his mother – a notion he continues to push back against. Honestly, I’m less interested in the relationship between Ray and his mother, and more interested in Ray and Xenos. That’s not to discredit the narrative built concerning Ray’s mother wishing for a new family, but merely the fact that Ray and Xeno’s budding relationship feels so natural that it pulls you in. What started as genuine conversations between two people discussing their personal tribulations, has grown into an understanding and caring friendship that could lead to great places. I, for one, am curious to see where this goes. The real hook of the issue comes into play when Ryan announces that he’s managed to track Palmer. This is what we’ve been waiting for! Batman pulls Lobo and Frost to help him work with Ryan go to the Microverse in search of Ray, leaving Black Canary, Vixen, and Ray to look after this universe. Although this is presented as Ryan’s desire, Batman has to have a need for Ray as well. Let’s not forget, Batman originally wanted Palmer to join the JLA, and rejected Ryan. There has to be a reason Batman wanted Palmer specifically. The story continues, and then the unimaginable happens… We get exposition. And it’s decent exposition! Orlando takes time to build the foundation of the story before jumping head-first into the deep end! Guys… We’re not going to be thrust into the climax of a story within the first issue! Ryan walks the team through his understanding of the Microverse, how they’ll get there, and how they’ll track Palmer once there. As expected, things can’t go smoothly for our heroes, so the moment they arrive, they’re met with force – creating a high-energy, fun action sequence to carry the remainder of the issue. The most exciting condition of the battle is the fact that we know nothing about the attackers – nor do the heroes. They’re in this blind, and we’re right with them in the scuffle. The energy in the issue continues to build, before closing out by revisiting a cliff hanger we were teased with months ago! When all is said and done, there isn’t a lot that happens in this issue, but it’s still more satisfying and gratifying than any other issue that’s come before it! The plot is tight and polished, and the character work matches that which I’ve come to expect from Orlando. If he can maintain this quality, we’re going to have a ton of fun over the next few months! The Art: Oh, Reis! I’ve never been so excited to see you! Following issue after issue of poor art, we’re treated with a one-two punch of a strong script and outstanding art! The technicality of Reis’ work is easy to see, and well worth endless praise, but he also tells stories so well! From facial reactions, to posture, to atmosphere, he creates scenes that you can imagine playing out in front of you. You feel them, experience them, and that does wonders for a book. I recently stated on Twitter that if comics were film, artists would essentially be every actor, cinematographer, and co-director… Let that sink in for a bit. An artist can be the sole reason a book sinks or swims – whether readers realize it or not. Reis, clearly, is a Phelps-level swimmer here! Characterization. With a team book, you need to provide enough space to let characters “reveal” themselves. If you don’t allow this, the cast begins to feel interchangeable, and typically just allows for a panel to help give them their “identity,” which ultimately comes off as feeling forced. Seeing characters that aren’t the focus of this story get more than just a page to stretch their legs is a refreshing change from the standard we’ve come to expect. Tiny World, Big Possibilities. The Microverse is an interesting concept, and one that is new to me. Hell, considering I don’t know too much about The Atom, it might be a new exploration for comics in general. I know Ray has struggled with going too small before, but I can’t recall if it’s ever actually led him to a new world. In comics, we’re constantly dealing with big threats that put the entire world at danger. This, story, in many ways, is similar while also being the antithesis of this idea. This isn’t a “big threat,” this is a very small threat that could unravel the very thing that allows our world to exist… I dig it. The Battle. The battle is quick and fun, but the real intrigue here is that the mystery man is the reason the team “wins.” I love the colors used here, as well as the flow of the action by Reis. It creates a visually pleasing experience that helps build momentum in the back-half of the issue. I don’t consider this a bad thing, but some readers might be disappointed that this issue doesn’t cover much ground. The last page of the issue is the “reveal” of who Ryan believes is Palmer… Which is something we’ve already been teased with. Regardless, the world and the mission have been set-up, so now all we need to do is explore this journey and mystery of who this man is (Palmer, or not), and go from there. I just hope that during this epic, the JLA members remaining in our universe get some type of mini-mission(s) to help add extra layers to the narrative. You’ve been waiting for a good issue. You want to read the Justice League of America you felt was teased prior to the book’s release. We’re going to the Microverse, y’all! Overall: “Crisis in the Microverse” takes makes a giant step in the right direction for Justice League of America. A title that seemed doomed to fade away into obscurity following a number of poor stories, pulls out an astonishing comeback by delivering the coming we’ve been expecting since DC Universe’s Rebirth and the announcement of JLA. With six issues at his disposal for this story, Orlando is able to flex his craft by fleshing out characters and setting up, what appears will be, one hell of a story! If you’ve given up on the book, give it another shot!